success in the coffee shop industry is about brewing a community environment. to symbolize the chain store more than the corner store. Starbucks is trying to replicate, says Herman. where Herman created not just a coffee shop, but also a community center. walk out [of Boulevard Park] is so foreign," Herman says. use of tumblers for hot or cold drinks as an environmentally friendly practice. environment to have levels of comfort." heard Howard Schultz say that they had lost their cozy, warm environment,"
what we do and how we do it and are trying to capitalize on it," Herman says. and was forced to re-establish himself in Bellingham with multiple sites. freeway doesn't speak to who we are." 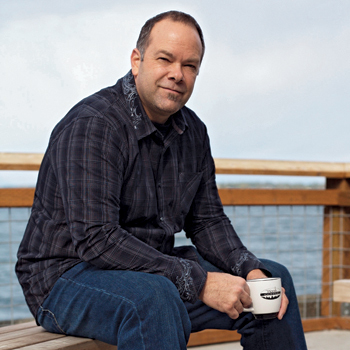 coffee in his nine Whatcom County locations are donated to the school. community, no matter where that community lies.